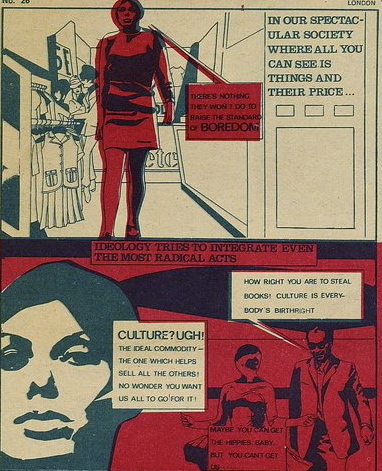 This week, as well as continuing to be a participant in Tino Sehgal's These Associations at Tate Modern I've been working to build the community of readers around the regenerated International Times where this image comes from, from a Situationist poster in 1968. I was also the guest speaker at a seminar at the Royal College of Art's MA Critical Writing in Art and Design on Media Platforms: Writing re-imagined in the age of hybrid media, convened by Monika Parrinder. The session was very stimulating and included the students writing collaborative on google docs about their nearly incidents for the www.nearlyology.com website. I'll post their contributions there next week. Here's the course description and a useful booklist too. - How can we inhabit new writing spaces? - How can we develop writing as a set of encounters between people, media and contexts? - What roles can writing – as critical practice – play in this culture? Rather than simply jump on the bandwagon of new developments, how can writing weave things back into a framework for thinking? The introductory session… aims to situate new writing practices in a ‘feedback culture’. This is a broad cultural condition where media are hybridised and distributed, and production and consumption occupy the same space; and people’s clicks and comments are looped into the process. What are the implications for word and image, writer and reader? In high-tech, high-speed, high-res world, how can words compete with the image? Should they even try? Perhaps writing has a renewed importance, as refuge …reflection …as what? We will map some of the emerging roles and modes of writing in this realm. On a practical level, we will be asking what possibilities and challenges all this provides for writers, writing and reading. On a philosophical, we will be thinking about what implications they have for future-possible writing.